Just a photo that came across my stream, taken for Life magazine but not published there. This is from ALA, in 1971. I saw the photo and wanted to know more about it. 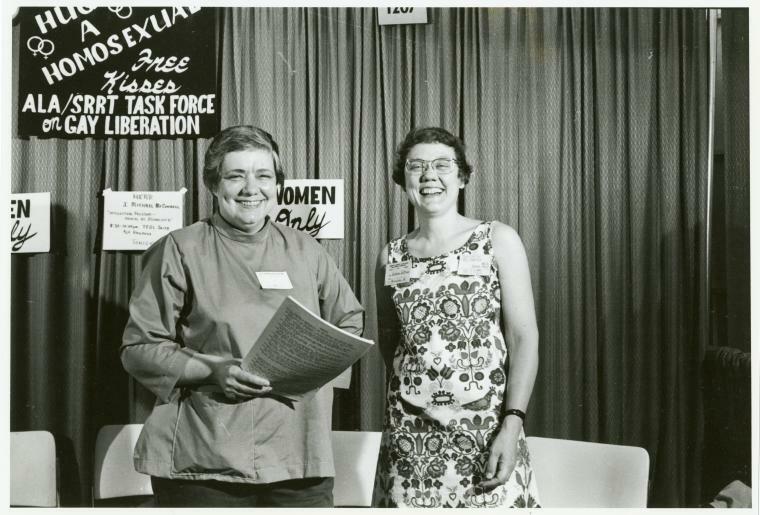 As a former member of SRRT and someone who knew about early GLBT activities within ALA (and in the current political climate) from reading Revolting Librarians, I enjoyed seeing this photo but I had a lot of questions. Who were these people? Who planned this? How was it received? So, like any good librarian, I researched. Some other folks on facebook filled in some of the blanks about this event. A quote from another librarian, pulled form a relative who commented on his timeline “ALA’s Gay and Lesbian Task Force was the first such professional organization in the country. And with their bibliographies they helped create new areas of research.” A few more photos of the SRRT booth are at NYPL. Plans for the division’s booth in the ALA Professional Exhibit area at the 1971 ALA Conference in Dallas included scheduling different board members to be on-hand to meet with visitors. 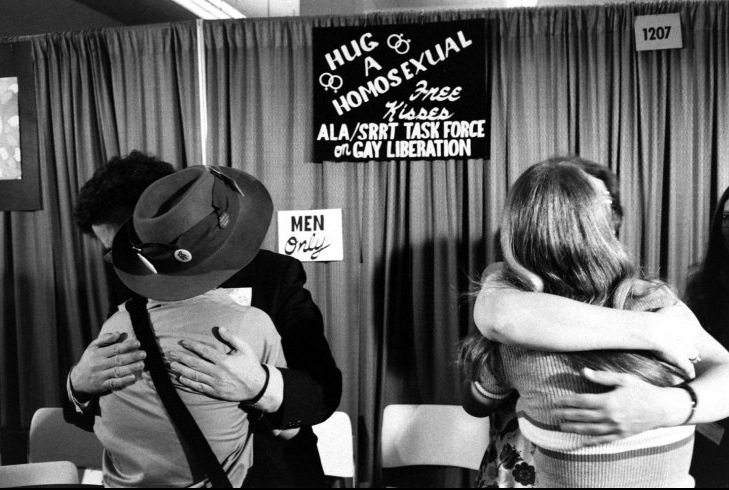 When the â€œHug a Homosexualâ€ and other exuberant and high-spirited activities in a neighboring booth proved newsworthy to the extent that television cameras appeared and reports were broadcast nationwide, an on-hand board member from a conservative community shielded his face and moved to the remote side of the booth. At another point, when the RSD booth was staffed by a librarian clad in the habit of her religious order, a young volunteer who was intimidated by the boisterous goings-on in her booth came next door seeking â€œsanctuary.â€ According to American Libraries, â€œFarcical tumult reigned in the exhibit area when the Gay Lib group staged a ‘Hug-A-Homosexual’ stunt that attracted press and television but few hugs. The book Before Stonewall has called this event “The first gay kissing booth” and is worth reading for more great stories about what a nifty person Gittings was and what sort of work she did within ALA. Here is a quotation from a blog post after her death in2007 discussing what drew her to librarianship. One of Gittingsâ€™ proudest achievements was what she called â€œcombatting lies in the library.â€ Gittings had experienced her first attractions to women when she was in high school. She was denied membership in the National Honor Society by an advisor who said she had â€œhomosexual tendencies,â€ and had been told by her father, with whom she was close, to destroy the book The Well of Loneliness which he found in her bedroom when she was in high school. Determined to understand her own path, she spent most of her freshman year at Northwestern University in the library instead of in class, searching for books and information about being a lesbian. What little she could find was catalogued under â€œsexual perversionâ€ and â€œsexual deviance.â€ She dropped out of Northwestern then to pursue the life of an activist and never returned to get her degree. There are many more anecdotes and names named in Wayne Wiegand’s Encyclopedia of Library History. I know for people who are more on the inside of this movement a lot of this is just old news, but I hadn’t known a lot of this before. And, at this time in history with some important cases before the Supreme Court and public opinion rapidly shifting, it’s neat to look back and see at least part of the profession taking an early and affirmative stand for equality. sorry, this is a bit off-topic. i saw you on neatorama. i just wanted to say so. when i am on the road libraries in small towns are my lifeline. often i like to go in and tell them that i am the one sitting curbside using the wifi today in the morning and in the evening before returning to my campsite. that connection lets me email my mom to tell her i’m fine, and it lets me find information and maps i need. i do not need to tell you how important and multidimensional your work is. i do want to say thank you.